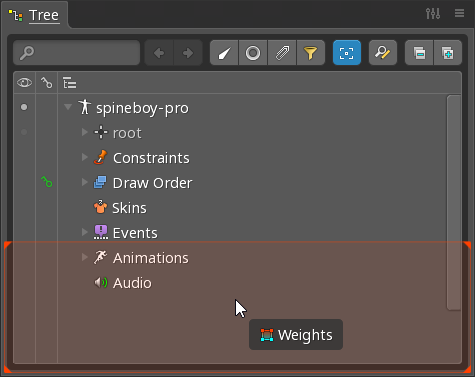 Spine's user interface uses a tabbed view system to organize tools. This gives you the flexibility to customize the workspace to your liking. Views are opened by clicking the Views select box at the top of the screen. Views that are already open are shown in light gray. 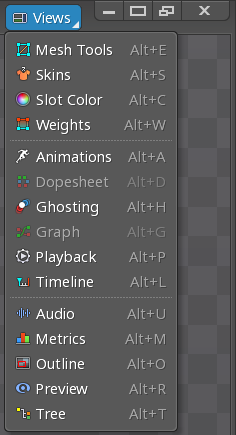 Different views are available in setup mode and animate mode. Each view has a tab at the top. The tab can be dragged to move it to a new position. An orange rectangle will appear where the tab can be dropped. A tab can also be dropped next to other tabs. Views can be resized by dragging the edge of the view (highlighted in red below). A view can be minimized by left clicking the menu icon to the right of the tab, then choosing Minimize. Alternatively, a view can be minimized by right clicking the menu icon. Minimized views appears as icons next to the Views select box. Clicking an icon restores the view to its previous position. All views can be minimized by clicking the minimize button next to the Views select box. Clicking it a second time restores all the views that were previously minimized. A view can be closed by left clicking the menu icon to the right of the tab, then choosing Close. Alternatively, a view can be closed by double clicking the menu icon. Closed views are hidden until they are opened again using the Views select box. 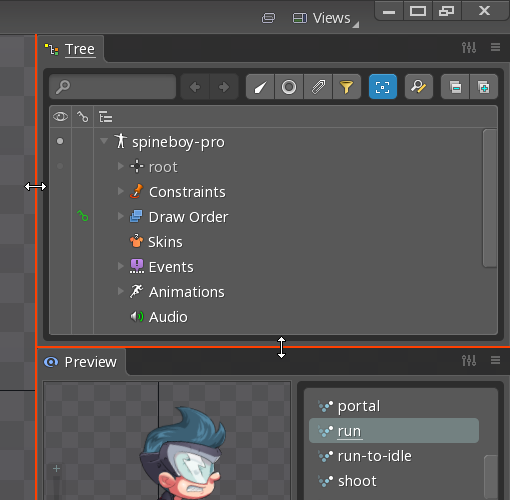 Spine currently does not support detaching a view as its own floating window. Until then, the Spine window can be unmaximized and then stretched to span multiple monitors. When using multiple monitors, the editor area toolbar may not be in the ideal position. It can be moved by clicking the small lock icon to the left of the toolbar, then dragging it left or right. Another issue with multiple monitors can be that dialogs open in the wrong position. 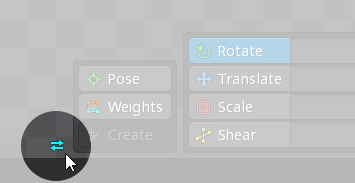 To fix this, any dialog can be moved to the desired position and all subsequent dialogs will open at that position. If the Spine window is resized, the dialog position is reset.